Everyone loves skunk...Popular in the US, the new Skunk brand range of quality natural papers are extra thin, slow burning and use natural gum. 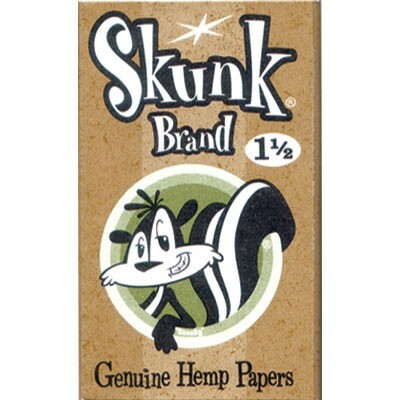 Skunk rolling papers are made in the country of Spain from pure natural paper. Skunk rolling papers have a lot of loyal customers, they love the iconic Skunk character "Skunky" as well as the nice and slow burning rolling papers. The concept behind Skunk is from Skunk founder Orion. Orion would frequently smoke his own rolled cigarettes, and would have people shun him when he was around. When he smoked people would remark that his cigarettes stunk. Orion felt like a skunk, and the idea for Skunk was born.